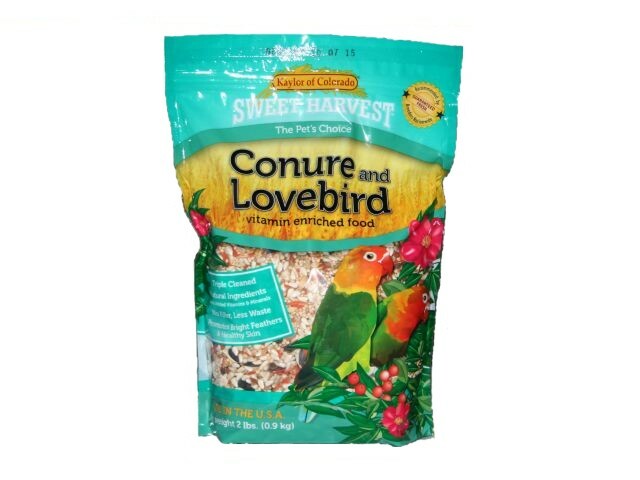 Kaylor Sweet Harvest Conure and Lovebird seed blend is a mixture of clean,fresh seeds,vegetables, fruits and other tasty ingredients that are fortified with vitamins for a good, nutritious addition to your bird's diet. Feed along with pellets, fresh vegetables and fruits for the best variety. Always have fresh water available. Store in a cool, dry place. Ingredients:Safflower Seed, White Proso Millet, Canary Seed , Wheat, Oat Groats, Green Peas, Barley, Buckwheat, Black Oil Sunflower Seeds, Pumpkin Seeds, Papaya, Carrot, Raisins,Peanuts, Cuttlebone, Cinnamon Sticks,Safflower Oil, Soy Flour, Vitamin E Supplement,Zinc Oxide, Ferrous Sulfate, Calcium Carbonate, Niacin, Vitamin A Acetate, Copper Sulfate, Ascorbic Acid, Sodium Chloride, Thiamine Mononitrate, Vitamin D3 Supplement, Riboflavin, Pyridoxine Hydrochloride, Folic Acid, Calcium Pantothenate, Vitgamin B12 Supplement, Inosistol, Potassium Chloride, Magnesium Oxide, Dicalcium Phosphate, Choline Chloride, Manganous Oxide,Ethlenediamine Dihydriodide.